What Can I Do for these Brown Melasma Patches on My Face? Are you suffering with embarrassing, dark discoloration on your face that bothers you every time you look in the mirror? Is it impossible to cover with makeup? Have you spent hundreds (or thousands?) of dollars on different skin care products that don’t do a thing to help? If this all sounds familiar, we’re glad you found us because we can help you! 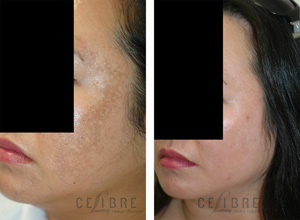 Since 2004, Celibre Medical Corporation has treated thousands of patients just like you who are suffering with a frustrating condition known as melasma. We have spent countless hours developing proven treatment strategies that really work to control melasma. 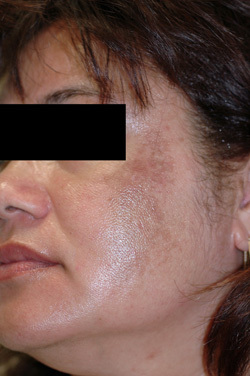 Yes, you read that correctly: melasma is a condition that can be controlled, rather than cured. We spend a lot of time educating our patients on their melasma because it will require some patience, dedication and long-term focus to keep it under control. But the results are well worth the effort, and we will provide you with the support, care and encouragement you’ll need to get your skin looking its very best again. It is a condition that usually affects women, and is often referred to as the “mask of pregnancy”. Though becoming pregnant isn’t the root cause of melasma, the hormonal changes that occur are just one of the different things that trigger it to mysteriously appear during that time. Almost out of nowhere, dark brown appearing patches can appear on the forehead, cheeks, upper lip and neck area. And while it’s not a sign of something serious, it can be really aggravating to have to look at and cause you some anxiety about your appearance. It is also common in women who take oral contraceptives for birth control (they have hormones in them too) and those with darker skin types. Believe it or not, we are really only now just starting to unlock some of the mystery around what causes melasma. Studies have linked it to multiple different things: endocrine dysfunction, medications, nutritional deficiencies and hepatic (liver) dysfunction can all be involved. Because it doesn’t usually occur in postmenopausal women who take estrogen replacement, we know that hormones alone aren’t the only cause. The one thing that is universal to everyone who has melasma is sun exposure. So in someone who’s predisposed to it, sun can trigger its onset. And no matter how careful you are about it, everyone gets UV exposure when they are out and about in their daily life. It also seems to get worse with heat and humidity, which depending on where you live can be completely unavoidable too. 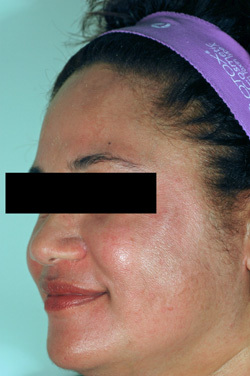 Melasma is a multi-factorial, lifelong problem for the many women who suffer with it. Celibre understands this. Our goal is to not only educate you about your melasma, but also recommend and provide you with the most effective tools for you to use to keep it in check. It really is a problem that takes a team approach. Come visit us at either our Los Angeles or Orange County offices today. We can help you better understand what’s happening to your skin and work with you to find the solution that’s right for you. What are you waiting for? Give us a call today to get started. Contact us today to schedule a FREE Melasma consultation!